Washington enforces “keep right except to pass” laws. Washington law states, “It is a traffic infraction to drive continuously in the left lane of a multilane roadway when it impedes the flow of traffic.” It doesn’t matter if you’re driving the speed limit. 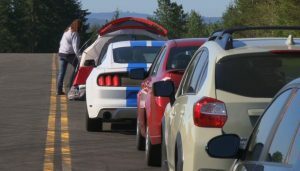 In 2016, Washington state troopers stopped more than 16,000 left-lane campers for breaking the law, according to the Seattle Times. Many likely drove off with a $136 ticket. There are exceptions, for example, when maneuvering to avoid an obstruction, giving extra clearance around emergency vehicles, or exiting on the left. And, of course, when freeways are in the throes of rush hour, troopers expect bumper-to-bumper cars in every lane. Washington has a few additional restrictions and clarifications. For example, if there are three or more lanes moving in the same direction, the left lane is off-limits to vehicles towing trailers and those over 10,000 pounds. Another surprise for some drivers: The HOV lane is not considered the left lane. Left-lane camping isn’t just illegal and annoying. It can be dangerous – not necessarily because it causes accidents, but by sparking road rage. Troopers agree that if you find yourself stuck behind a slowpoke, resist the urge to “educate” him by honking, gesturing, flashing headlights, or tailgating. Thanks, Nancy. I just thought that I would mention that the left lane may also be used for passing.